Rookie All Star Award - celebrates the rookie team exemplifying a young but strong partnership effort, as well as implementing the mission of FIRST to inspire students to learn more about science and technology. It is the most prestigious award a Rookie Team can receive. One award was given to each of the four divisions at the Championship. We are one of the 4 best rookie teams in the world! Highest Rookie Seed - for outstanding robot performance. Celebrates the highest-seeded rookie team at the conclusion of the qualifying rounds. Read the article on Oregonlive by Luke Hammill from The Oregonian, The Hillsboro Argus Oregon Live News. 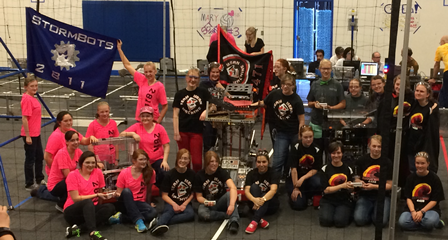 Thank you to our Girls' Generation Alliance, Team 2471 and Team 2811. This year's challenge was released in January 2013 during the kickoff event! ULTIMATE ASCENT is played by two competing alliances on a flat, 27 x 54 foot field. 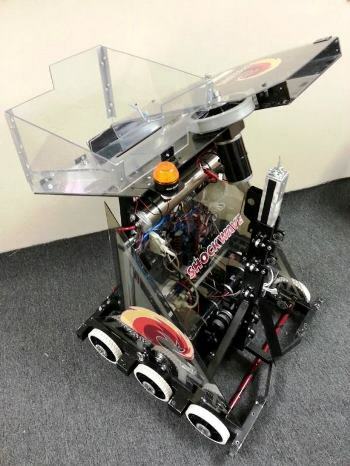 Each Alliance consists of three robots, and they compete to score as many discs into their goals as they can during a two (2)-minute and fifteen (15)-second match. The robot starts at the bottom of the ramp and then climbs to the top marker. It then stays for 3 seconds, goes to the middle marker and then finally goes to the bottom marker, for a final 3 seconds. At this point the teleoperated period begins. When a position button is pressed by the driver, the robot moves to the corresponding marker. Example: When the "Top Marker" button is pressed, the robot will go to the top marker and stay there. 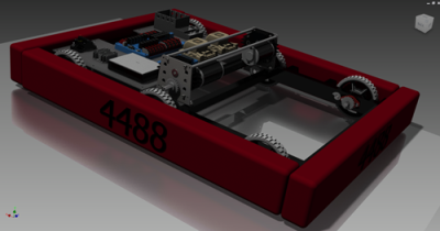 The Club designed their first Drive System inspired by Team 254.